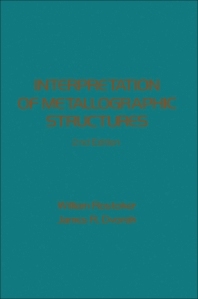 Interpretation of Metallographic Structures, Second Edition describes the features of metallographic structures using an optical reflection microscope. This book is divided into six chapters and starts with an examination of the polycrystalline structures, subgrain boundaries, and an overview of cold and hot working, as well as recrystallization and grain growth. The next chapter explores the metallography of fracture, which involves visual inspection, low-power stereoptic light microscopy, polished-section light-reflection microscopy, and the scanning electron microscope. This topic is followed by discussions of the different types of crystallizations, the mechanism of solid-state transformation, and the diffusion and other transport processes. The last chapter involves the measurement aspects in metallography, including measurement of grain and particles sizes, as well as their distribution. This book is intended primarily to metallurgists and researchers.